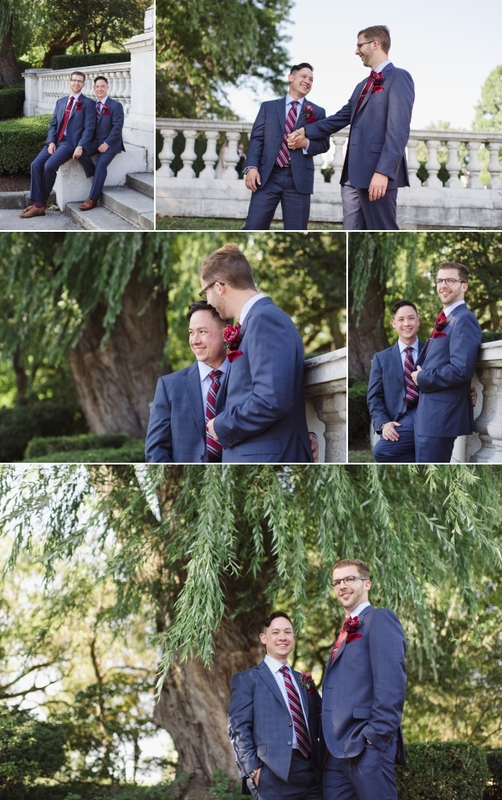 So excited to share that Max and Chris’ wedding from last year has been published in Gay Weddings & Marriage Magazine! Click the link below for their heartfelt, intimate and unique celebration! It happens about twice a year when I never meet a client before their wedding. 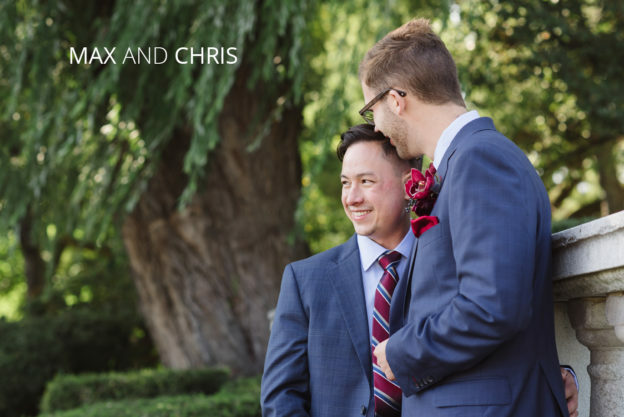 With max and Chris, I had never even talked to them before their wedding, with exception of a couple emails. 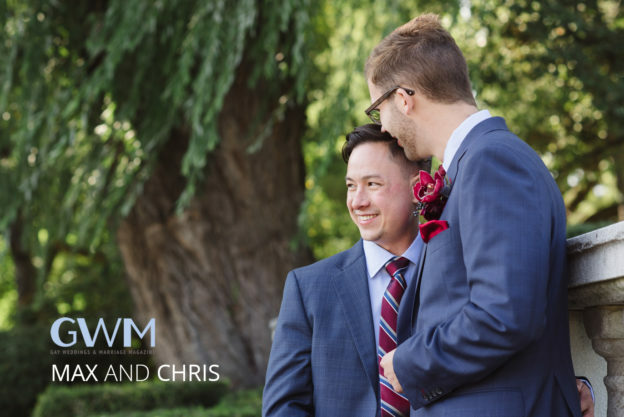 Within the first ten minutes of meeting them both on their wedding day, it was so obvious that the day was going to be amazing and this quickly became one of my favorite weddings of the year. They both have truly funny senses of humor with a pinch of dry humor, my absolute favorite personality type to be around. Chris happens to be a deeply romantic person- he told me he sent max flowers before their first date! Talk about a great first impression. Fast forward to their wedding, which was actually a small ceremony in DC, and then on to this day, which was their large formal celebration with friends and family. I met up with Max and Chris at the Westin in downtown Cleveland on this hot September day. The lobby of this Westin was so sophisticated I simply had to start their portrait session there. My favorite part was when their moms put their boutonnieres on. Chris’ mom just took a moment to look at him and it was such a tender interaction. 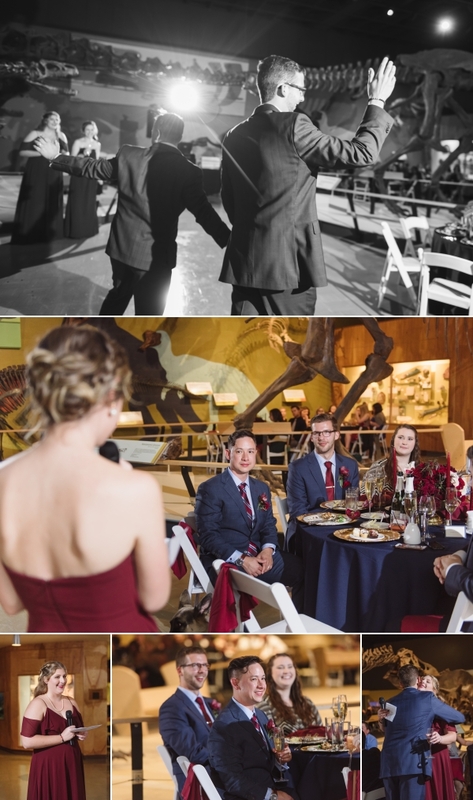 From the lobby, we traveled to Edgewater Park, Wade Lagoon and then on to their reception site, the Cleveland Museum of Natural History. 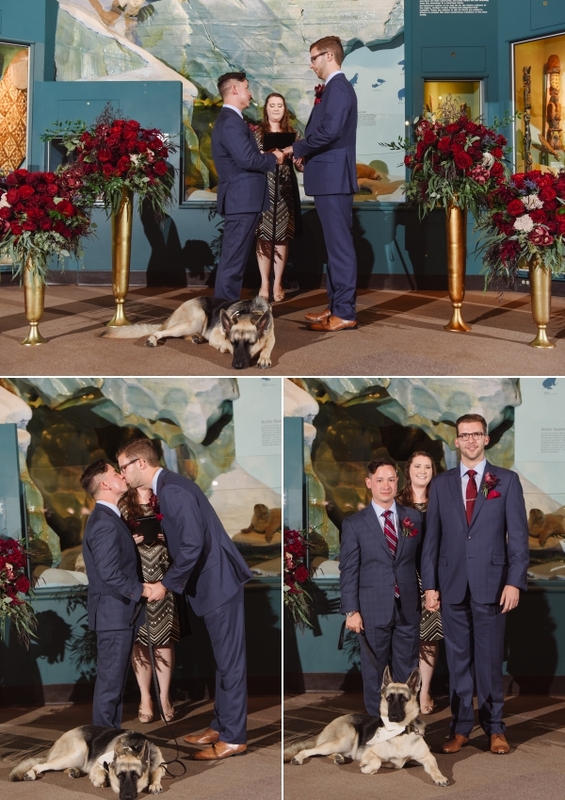 Their dog Maverick was by their side the whole day as the guest of honor. The natural history museum was a seriously cool venue to hold an event. Large dinosaurs, stuffed animals, gemstone displays and a “space” tunnel were some of the highlights. With Natasha Churches from Perfectly Planned weddings at the helm, you know everything was taken care of from start to finish. Jan Kish provided two grand cakes. One was a small cake with two golden dinosaurs on top. Each of the dinosaurs was wearing small bowties. The larger cake had two grooms on top and their initials on the front. Both cakes carried art deco overtones with gold accents that made them both so elegant and sophisticated. Vessel Florals filled every room with containers of deep red roses and greenery. The family came together and provided overflowing towers of cookies. It was hands down the best cookie display I’ve ever seen! The whole day was so much fun and on my drive home I felt so lucky to have spent this day with Max and Chris and their loving family and friends! All Images Copryright © 2019 Jessica Miller Photography. All Rights Reserved.